Roll to your Prom on KegBus! Does KegBus do Proms? Yes we do! KegBus offers a unique, fun, and safe transportation service for riders of all ages. 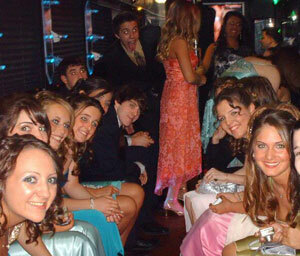 Our vehicles provide a social atmosphere while staying safe on Prom night. Prom trip costs are done per person and are based on vehicle capacity. We take underage drinking very seriously. KegBus does NOT provide ANY alcohol to of its customers, even if they are 21 years of age! We DO provide a safe transportation option to people of all ages! Prom goers, Parents, and School administrators please read our Prom regulations here. Find the best transportation for your budget! You want to look good at prom or homecoming, and have a great time. Its a once in a lifetime experience. Don't even think about bringing alcohol, drugs, or smoking during your trip, or bringing them to your prom. Many students have tried this in the past and it has never worked. All it is going to do is get your night canceled early and possibly a visit with the police! You are NOT smarter than all the generations before you who have tried! KegBus screens all bags and NO outside beverages will be allowed on the vehicles. We provide complimentary sodas and water with all of our prom rentals. Safe Transportation! It may not seem like a big issue now, but if you knew how many people die in car accidents each year due to alcohol related accidents during prom season, then you'll be glad you have a safe professional driver! Parents want you to have a great time, and be safe. Involve them in your planning process. All Prom rentals must have a parent signature! Don't attempt to put more people in a vehicle than it can hold. If a party bus is a 30 passenger, that normally means 30 people MAXIMUM! Also remember you are going to have tuxedos and dresses on, on a hot day. The more people in the party bus the hotter it will be, even with air conditioning. Reserve your party bus early! Successful limousine companies will often turn down prom customers because there is simply more demand than there is supply. Prom season is the busiest time of year for many limousine services. Party buses are too expensive - Not true! In many cases, your per person cost is less than what you will spend on a prom dress, tuxedo, or your prom ticket! Book Early, Request a custom quote here! Got questions on what the KegBus is or how it works? Check out or FAQ's, for more info on KegBus!